Western modern world has developed many tools for bringing more comfort to our lives. We can appreciate those efforts and results - but at the end, material things will not bring fullfillment and happiness in our lives, maybe the feeling of security, but even this stays pray to impermanence. True happines can only be realized, manifested within our state of being, our experience of life, through mind-training. Only this will bring us undestructable, unchangeable groundedness is wisdom and compassion. What is the purpose of accumulating immeasurable richness of outer things, if we stay beggars in our inner condition? To run after gain, wealth, honour, a good reputation will only result in more confusion. Only through authentic methods of training the mind in wisdom and compassion, we can reach ultimate happiness, which transcends the strong waves of our strong ways of dualistic and discursive thinking. It is this service of transformation, which we are offering with our activities. 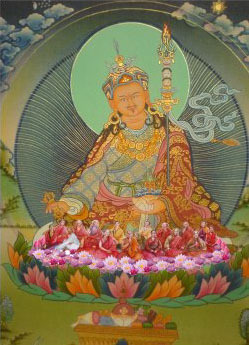 May the wishes of the Wisdomholders of all cultures and all historical times be fullfilled, may the compassion of the caretakers of humanity be brought into the hearts of all sentient beings, may the virtues of the collected efforts of all transmission lineages of wisdom and compassion be successfully brought into all universities, all academies, all parliaments, all political institutions. May all selfish ways of acting and thinking decrease, may loving kindness increase - May sanity more and more be reinstalled in all our economical, political, cultural and spiritual institutions!